Autumn in the Northeast is a special time for families. Just as you remember the crisp hayrides, pumpkin patches, and spooky Halloweens of your youth, your children are experiencing the changing colors and the fall festivities with young, fresh eyes. They’re excited to choose their costumes, pumpkins, apples, and holiday decorations. 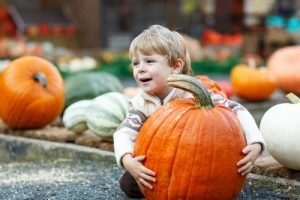 Just as your childcare center will be celebrating the season with fall activities, you’ll want to indulge your kids’ seasonal spirit by embarking on some of the unique offerings our region has to offer in the coming months. Late September and early October are great times to pick apples and choose pumpkins. 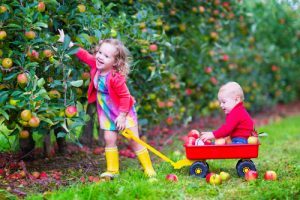 Luckily, many of our local farms have orchards and offer kid-friendly experiences that will have your kids yearning to return year after year. Blue Jay Orchards in Bethel, CT, is renowned for its apple picking, wagon rides, cider donuts, and other fresh baked goods. Some parents may even remember spending afternoons at Blue Jay in your youth! Nearby Castle Hill Farm, in Newtown, CT, boasts a pumpkin patch, hay rides, and even a corn maze! This farm offers a unique autumnal experience for kids of every age. Over the state line, check out Wilkens Fruit and Fir Farm in Yorktown Heights, NY. Pick your own apples, and enjoy cider donuts and baked goods from one of this farm’s three markets. If you celebrate Christmas, your kids may even want to return in December to chop (or watch them chop) your own tree. Fishkill Farms in Hopewell Junction is another family favorite. This farm offers a wide variety of apples to suit every foodie’s appetite. Their farm store offers the traditional cider donuts and baked goods, but also offers fresh eggs and produce, as well as cheeses and meats from across the Hudson Valley. For an event that pulls out all the stops, venture out to the Stamford Museum and Nature Center for their Harvest Festival, in Stamford, CT. Drink apple cider, carve pumpkins, march in the costume parade, meet farm animals, enjoy live music and face painting, and even take a hay ride! This event will help your kids build fantastic memories and will have them begging to return the following year. If Halloween is your thing, go big by attending the Stepping Stones Museum’s Monster Mash in Norwalk, CT. This event is geared for kids of all ages, promising to be lots of fun without being scary. Dress your kids in their costumes, or get them ready for the big night by creating their own Halloween masks. Decorate pumpkins and make your own festive tote bags for collecting treats on Halloween night. Last but not least, Tarrytown, NY offers a host of spooky activities this time of year. The home of Sleep Hollow, Tarrytown offers haunted hayrides, cemetery tours, haunted mansions, and, for lighter fare, parades, farmers’ markets, live music, and street fairs. This season is bursting with events in Tarrytown, so check out their calendar and make plans for this weekend! What’s your favorite autumnal activity? Let us know in the comments, or have your kids share their seasonal stories with us at daycare!